I was making some sleep and relaxation balms and salves as gifts. Partly also because I wanted to start making my own lip balm because the EOS stuff I’m using seems to make my lips peel…? Very annoying. 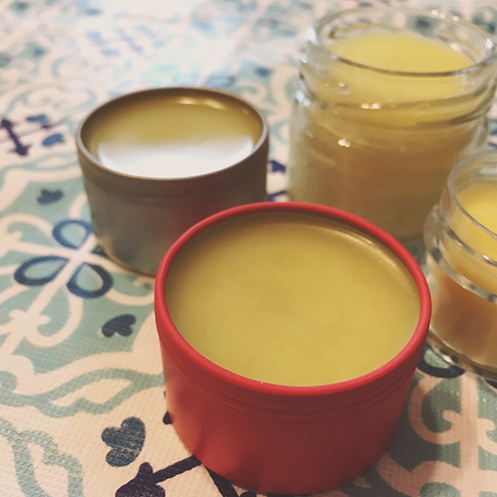 Anyway, after doing much research and comparing recipes, because I also don’t want to invest in a lot of material to start (and essential oils tend to be a bit costly), I bought some basic material and made some solid perfume kind of balm, and a salve for heels as well. 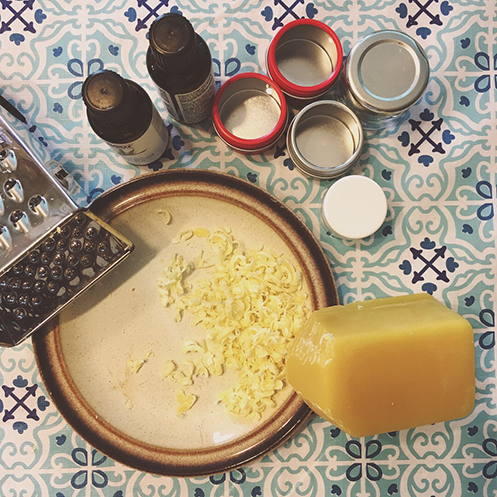 For the solid perfume, I used one part beeswax and one part extra virgin olive oil. The olive oil we just always have for cooking, and the beeswax I got it from the Bee Shop, from local bee keepers. Distributed in clean small containers (tiny jam sample jars and David’s Tea tins!) — I filled 2.5 containers, and then made a bit more following the same beeswax to olive oil ratio to make 4 containers. This sleep balm proves to really work for sleep, applied to the temples and soles of feet before bed. My friend and I both tried it and it worked! So If you have trouble sleeping I’d suggest giving it a try! I tried it as a lip balm but it didn’t go on very well. So I did some experimentation on myself with this salve. It works well on the heels, but not so great on the lips or face, as it is quite greasy‐feeling. I think it’s also great for dry hands and it smells great. I think maybe this is why a lot of lip balm recipes call for shea butter or cocoa butter. I’ll give that a try when I have a chance to go to the health food store. Also, I only bought a 175g block of beeswax and I still have more than half left! It goes a long way. ooh i should give you the extra container of heel salve, smells additionally like coconut and more moisturizing.